After attending True Parents in America for many years, and serving as Continental Director for most of that time, I recently received a new mission. On the 100th day after Father’s Seonghwa, True Mother called me to Korea, and I was selected as the International Executive Vice-President of the Unification Church, supporting our International President, Rev. 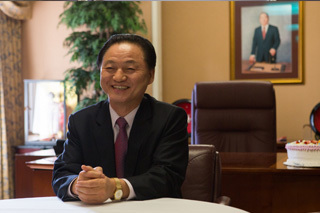 Hyung Jin Moon and overseeing the World Mission Department headquarters. I will also serve as the Chairman of the Unification Movement and the President of HSA-UWC in Korea and as a Special Assistant to our True Mother. To begin with, I will be working to organize and prepare the celebration of Foundation Day in Korea. It has been a great honor to serve God’s providence in the USA side-by-side with all of you, my dear American Brothers and Sisters. We have shared so many memorable experiences together, particularly during these last twelve years, attending our True Parents as they laid the foundation for the coming Cheon Il Guk era. We have worked to bring together clergy of many faiths who supported True Father, for the Middle East Peace Initiative; True Father’s 50-state speaking tour and many other providential tours; the deeply significant crowning ceremonies, the Las Vegas providence and OSDP workshops; and countless other historical achievements by our True Parents in America. Through it all, True Father has raised America to become the elder son nation, and placed his trust in you. It has been a privilege to work with you through all these unforgettable moments. We have certainly shared sorrow and difficulties as well. Just a few short months ago, none of us dreamed that our True Father would be gone from us physically, departing for the spiritual realm so soon. This is a challenging and serious time, but as I leave I want to remind you that there are so many reasons for hope. I am deeply confident that Foundation Day will be a new beginning for our movement. Our True Mother has become absolutely focused and resolute as the representative of True Parents on the earth. Communing with True Father every day, and operating in absolute oneness with him in the Spirit World, True Mother is in many ways in a different position now. She is standing firmly as the Central Figure on earth, leading the Providence with authority and confidence, despite the many trials she herself has been through. I am a witness to how much True Parents love America, and how much hope and desire they have for our members and families. Our True Father spent nearly two thirds of his public life in this country, investing his heart and soul in all of us. He loved this nation the most, knowing the great mission America has for God’s providence in the entire world. This nation has remained as True Parents’ number one priority. Even when he returned to Korea, the United States continued to occupy his mind, and he was compelled to return here again and again. With that same love, our True Mother sent Hyung Jin Nim to lead the providence in this nation, representing our True Parents. This is another great hope for America. Hyung Jin Nim was born and raised in this country, and naturally has a bright, loving and open mind toward this nation. During these final years with True Father on earth, Hyung Jin Nim was always at his side. I witnessed his absolute faith, love and loyalty to True Parents. True Father raised him as a spiritual leader since his early 20’s. We have all seen his deep humility, his warm and loving heart. We know his broad, embracing nature toward everyone. With Yeon Ah Nim by his side, he wants to empower and support Blessed Central Families as the precious root of our community. With a capable team led by Dr. Michael Balcomb and others, he is recreating our National Headquarters to support our local communities. Beginning from East Garden, which is filled with True Father’s spirit and foundation, Hyung Jin Nim is revitalizing our worship tradition. I am so grateful that True Parents prepared such loving and capable leadership for America. My Brothers and Sisters, True Parents have placed their trust in you as the elder son nation, and the world needs your support, hope and guidance. Your growth and prosperity as a church will continue to be a great example for our world community. God needs America to stand for the world economically, morally and spiritually. I know so well the talent, capability and passion of our members and leadership in this country, and I know what you are capable of. When I see so many of our young people inspired and involved at Headquarters, in the Gen Peace Academy and around the nation, I feel great hope for our future. I pray that you will come together in support of our International President and our True Mother at this most critical time in the providence. My dear family, it has been my great honor serving with you, and I will never forget the many experiences we have shared with laughter and the tears as we did our best to support our True Parents in this nation that they love so deeply. A huge part of my heart, my life, my lineage and family, is planted in the soil of this nation. I love America, and I love each and every one of you. Of course I am not far away. I am simply moving my office to Korea! I will continue to do all that I can in this international role to support the providence in America. I am sure that you and I will continue to work together. As we prepare for Foundation Day, we are all aware that we have too little to offer to our True Parents. But my dear Brothers and Sisters, please receive the great grace that they have prepared for this historical moment. They love us not simply because of what we have invested, but because they have invested in us completely. True Parents are inviting us, despite our limitations, to stand as their direct descendants on Foundation Day. I will be proud and grateful to stand with each one of you on that day. Despite the tribulations and difficulties we are facing as a community, remember that True Father is the Messiah, and stands with incredible power and authority to lead us from the Spiritual World. His heart is in True Mother’s heart, and her heart is in True Father’s heart. When Jesus died painfully and alone on the cross 2,000 years ago, he seemed alone, without followers or foundation, executed as a criminal by the mightiest nation on earth. Yet he cried out, “It is finished!” Given that miserable situation, who could have dreamed that Christianity would arise on the spiritual foundation he had established, to lead the world, move history and embrace over a billion people? When True Father finished his final public prayer, he said, “Everything has been accomplished” four times. Let us remember the unparalleled foundation that True Parents have established in their lifetimes, far beyond any religious founder in history. Upon that foundation, True Father’s teaching and tradition will no doubt move the world. How soon and how powerfully that happens will depend upon you and me. I am excited to work together with our American family to make God’s and True Parents’ dream of Cheon Il Guk a reality in our world. Please feel free to contact me with your comments, thoughts or suggestions, or simply to say hello. I will be praying for each and every one of you, for your families and your work, and I pray that God will continue to bless and guide America. l team as we step into a new territory with faith, intellect, courage and – moderation.